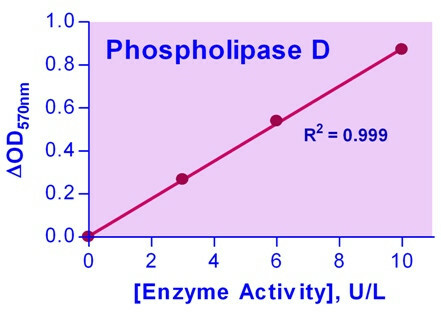 For quantitative determination of phospholipase D activity and evaluation of drug effects on phospholipase D metabolism. Phospholipase D (PLD) catalyses the hydrolysis of the phosphodiester bond of glycerophospholipids to generate phosphatidic acid and a free headgroup. Abnormalities in PLD expression have been associated with human cancers. BioAssay Systems’ method provides a simple and high-throughput assay for measuring PLD activity. In this assay, PLD hydrolyzes phosphatidylcholine to choline which is determined using choline oxidase and a H2O2 specific dye. The optical density of the pink colored product at 570nm or fluorescence intensity (530/585 nm) is directly proportional to the PLD activity in the sample. Applications For quantitative determination of phospholipase D activity and evaluation of drug effects on phospholipase D metabolism. 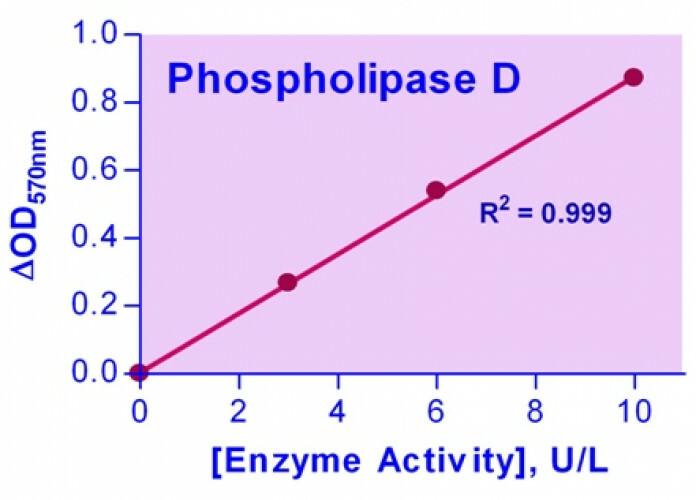 References Assay: Phospholipase D in Rat tissue (Pubmed).